On a recent podcast, I noted that Secret Circle earned the worst Brisnet speed figure of his career when he recorded a 97 for his hard-fought victory in the Grade II Rebel Stakes. I pointed out that this was not exactly a prescription for Kentucky Derby success, as the vast majority of Derby champs are progressing, not regressing, come the first Saturday in May. Since 1997, eight of 15 Kentucky Derby winners (53 percent) recorded their best lifetime Brisnet speed figure (BSF) in their final Derby prep, while all 15 earned a career-best number in one of their final three pre-Derby races. This means that for Secret Circle to stay on the right side of history, he’ll need to earn a BSF of 105 or better in his next start, which figures to be the Arkansas Derby on April 14. Frankly, I’m dubious… but time, quite literally, will tell. And speaking of speed or, more specifically, the lack thereof, the World Cup in Dubai this weekend promises to showcase the effect that pace can have on a race. To say that the opening half-mile of Saturday’s $10 million spectacle is going to be on the slow side is akin to claiming that Lady Gaga will make some questionable fashion choices in 2012 — a pretty safe bet. Among the 14 World cup entrants, Game On Dude appears to have the most early lick, but jockey Chantal Sutherland faces an interesting dilemma: she can either utilize Game On Dude’s speed, which probably entails opening up on the field in the early stages, or she can rate on what are likely to be soft fractions. Generally, such a choice is easy — rate on slow splits. But that might not be a real wise strategy in the case of Game On Dude. As a Facebook friend of mine pointed out, the son of BC Classic winner Awesome Again has not fared well in races featuring moderate-to-slow paces in the past. In fact, in his five career races that featured a -5 ESR or higher (slower), Game On Dude is winless, with just two seconds and one third. 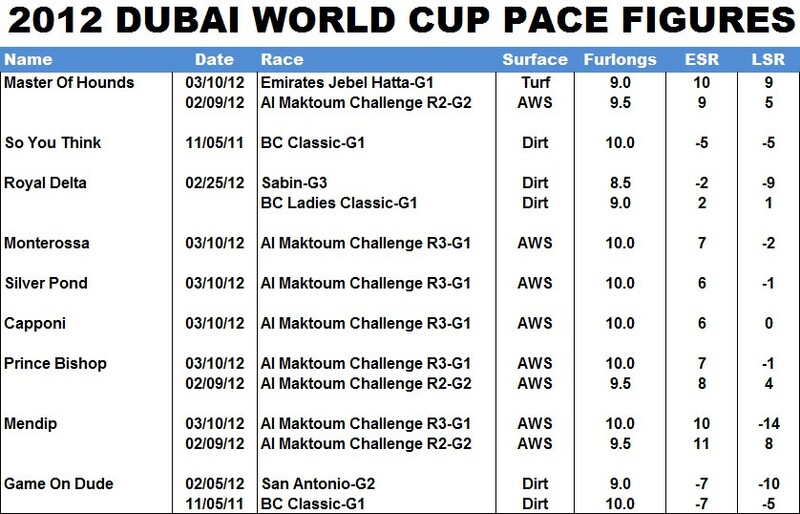 In practical terms this means that the Bob Baffert trainee will probably need to carve out the opening half-mile in less than 48 seconds to have a reasonable shot of winning in Dubai, which seems very unlikely given the 53.1-second half witnessed in last year’s World Cup and the parade of sundial splits seen in this year’s races at Meydan Racecourse. 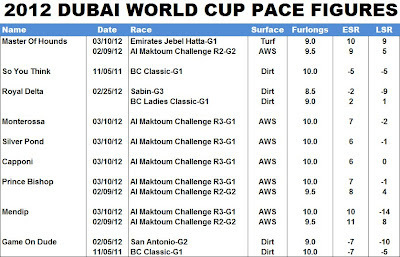 Complicating Game On Dude’s World Cup quest is the fact that, despite Michael Dickinson’s claims to the contrary, the Tapeta surface that he developed — like most synthetic surfaces — is decidedly biased toward off-the-pace runners. At Golden Gate Fields, where Tapeta has been in existence since 2007, only 23 percent of the races at one mile and 20 percent of the races at 1 1/16 miles have been won in wire-to-wire fashion this year. Compare that to the 33 percent of one-mile races and 40 percent of 1 1/16-mile races that have been won been won from flag fall to finish at nearby Santa Anita, which features a dirt main track, and one can readily appreciate the catch-22 that Sutherland and Game On Dude face on Saturday. At 3-1 on the morning line, Dude looks like an underlay to me. We value your dirham and thats why we provide the best advise to buy the best suitable car for you. We worked hard to collect the reviews through testing , drvinng and closely looking at the car , which will help to figure our the best car for you.